After much duress, my wife and I have decided to sell this magnificent motorcycle. It is my view that this “round case” 750 Sport is one of Ducati’s best and most sensual designs. We bought the bike and brought into the US from Germany in 1996 and have restored it with American know-how and technology. This motorcycle has been authenticated by world renown motorcycle authority and author, Mick Walker. The frame number or VIN # is 751375. I can be contacted by e-mail: italianiron@msn.com or cell phone is the easiest way: 520-730-7576. Mr. Walker featured our Ducati Sport in the book, Miller’s Classic Motorcycles 2002 where he was the general editor. 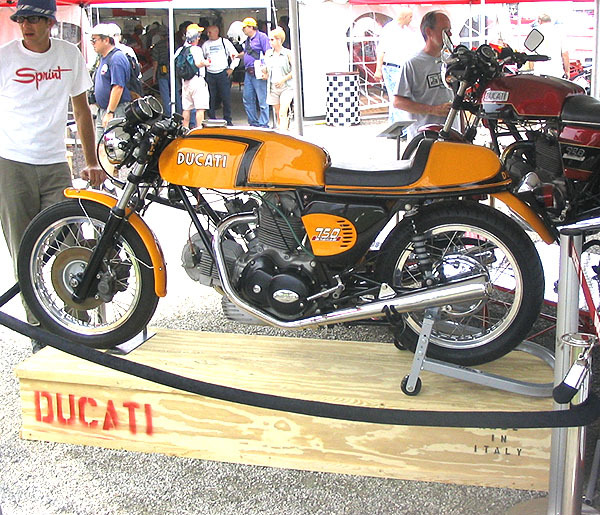 These motorcycles are so rare and it is estimated by Mr. Walker and Mr. Ian Falloon who is another authority on the history of motorcycles, that the Ducati factory only produced approximately 200 models after the famous win at Imola in April 1972. As it was so unusual to find a 1972 Ducati Sport, Mr. Walker had to publish pictures of our nearly completed restoration for this edition of the book. Please see page 39 [photos below] where the tail lamp and license plate bracket are missing and the alternator wires were still rolled up and unconnected. Mick Walker's letter of authentication is also shown immediately below. Mr. Walker adds, “Today, they are extremely rare.” You will also note from the photographs in the book, that the vertical cylinder bevel drive housing cover has the name “Ducati” highlighted and that there is the existence of a mechanical tachometer system that is the same as the current photographs supplied of our bike and taken at our desert home in Arizona. The "DUCATI" logo highlighting on the engine cover as well as the use of a mechanical tachometer is not correct but a personal preference. The electronic tachometer that came with this Sport never worked correctly and was discarded as junk. I like the Ducati company name highlighted as a personal preference. Despite the historical significance of this machine, I restored this 1972 Sport to be a usable machine for the street. It runs magnificently and is very reliable! The mechanical tachometer from a 1973 Ducati Sport has been used as well as a Dyna electronic ignition. This bike starts on the first kick and is extremely smooth and fun to ride. Very few machines that I have ridden have the same soul and offer that state of artistic “awe” as this early Ducati bevel drive 750 Sport. 32 mm Dell’Orto carburetors have been professionally rebuilt by Steve Allen of Bevel Heaven. These carburetors have the metal items unlike the plastic pieces that come with modern items. 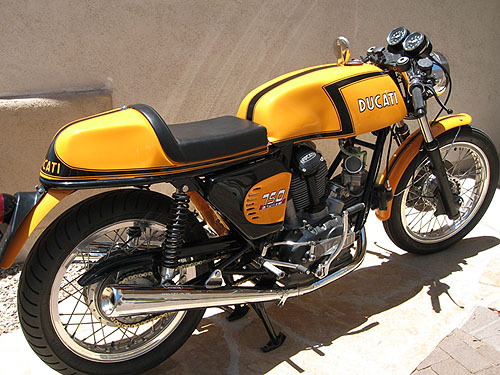 Our 1972 Ducati Sport has been re-painted with paint and with powder-coating when durability was required. Engine and frame bits have been re-polished, re-chromed and stainless fasteners have been used throughout. The front fender or mudguard of this Sport is original, however, the remaining bodywork has been made new from original molds owned by a dealer in Stuttgart, Germany. The rear fender is correct as it fills the entire area of the wider sub-frame. It is not a narrow Sport rear fender. On display at Mid Ohio "Vintage Days"
The fuel tank is specific to this 1972 Sport to accommodate the wider rear sub-frame that it shares with the 750 GT of that era. In Ian Falloon’s book, Original Ducati Sport and Super Sports on page 31 he writes,: “Central to the bodywork was a 19 liter fiberglass fuel tank that was narrower and longer than that of the 750 GT. The tank molding required recesses for the ignition key clearance and the splayed rear frame tubes. Unlike the 750 GT, the chrome-plated fuel filler cap hinged at the rear, opening toward the rider.” See my photos. The quality of the fiberglass is the best that can be purchased in Europe. It is ultra thick and is 7 mm at the outside edges alone. The internal sides of the tank have been coated professionally with resins to add additional resistance to holding gasoline in a fiberglass container. In all of these years I have never experienced this fiberglass tank to feel “soft and pliable” due to breaking down from exposure to the fuel like I did with the original item. It was due to the fact that the original fiberglass had become so significantly deteriorated and unsafe that I have replaced it all with this more superior modern technology. This Sport according to Mr. Falloon is also referred to as the “Z” stripe Sport as this production line was the only one to have this dynamic decal design with this particular fuel tank that is also unique to the 1972 Sport. In conclusion, my philosophy, much less my goal was to take the soul and beauty of this Ducati Sport and provide it with the best of modern technology . I know that there are purists that would prefer an un-restored example where the paint and chrome though original is peeling and flaking off while the gel coat and decals are faded. Whereas I appreciate that view, I cannot personally let something so aesthetically beautiful as the work of art that I believe it to be, look as it would be better at the scrap yard. Items that needed polishing or re-chroming have been lovingly and professionally corrected as well. Every item associated with reliability has been replaced. The 750 Sport motor has been totally rebuilt with new high compression pistons made to the correct Sport specifications by Karl Engellener of Motorcycle Machining Specialties in California USA. I am very confident that whoever buys this classic will be moved by the beautiful artistic lines of this motorcycle, the elegance, the historical significance, as well as the technological brilliance of its designer, Ing. Taglioni.. If you have ever wanted to own the rarest of the “round case” bevel-drive 750 Ducati Sports, then this Sport may be the one. For other reading/technical material on the Ducati Sport, you can pick up Ian Falloon’s “Ducati Twins Restoration Guide, Bevel Drives 1971-1985” , Mick Walker's “Ducati Twins Restoration” or “Ducati, Taglioni and His World-Beating Motorcycles” as well as many, many more that can be found in the library or through Bevel Heaven. Thank you for looking. This bike will be sold with a legal "bill of sale" and the title signed by me. The new owner will be able to go to the DMV for your area and do a simple transfer of title and pay the normal required transfer fees to get it registered for road use. The bike is available for pickup directly from me. If shipping is required, I prefer that you use the Bevel Heaven shipping service [click HERE] to get the bike from me to YOUR DOOR for $573 above the price of the bike. You can also arrange for your shipper to come to me and pick it up - I will not deliver it to any shipper or crate it for you without extra charges added. You will be responsible for all shipping costs incurred either way. This bike is located in Tucson, Arizona postal code 85737. If this bike interests you, please contact me at 520-730-7576 to set an appointment to view the bike or to discuss terms.